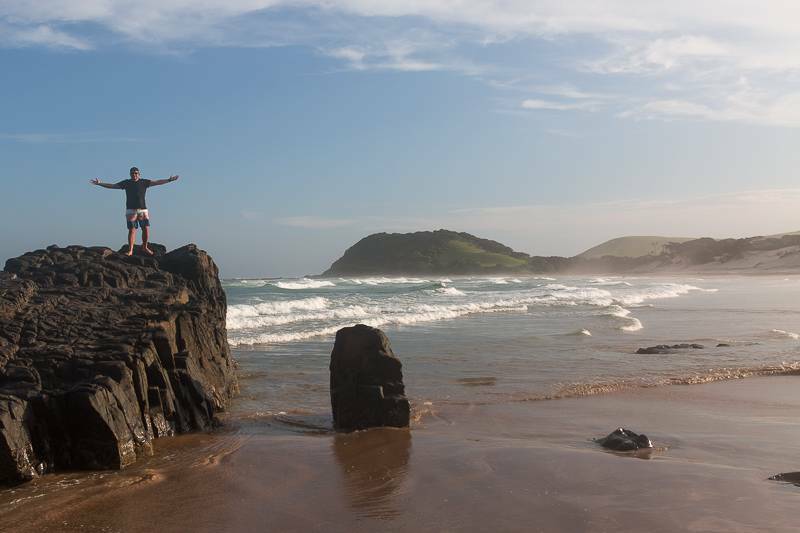 Ocean View Hotel in Coffee bay was the perfect base to explore from on our recent trip to the Wild Coast. Coffee bay has been on my bucket list for ages now and when we finally explored the area recently it was all I had hoped for and more. This lovely little gem is nestled between dramatic cliffs and endless rolling waves and provides the perfect place to stay while exploring the unique Coffee Bay area. We were greeted with a warm salty breeze and the sound of palm trees when we arrived after our long drive from Port Elizabeth. It instantly put me in a holiday mood and made me keen to drop our bags and head out to explore right away. The have outside bungalows as well as rooms inside the main building of the hotel and we stayed in a bright light room overlooking the ocean. Mike even put up his hammock in between the beams and almost spent both nights sleeping outside. The friendly, family atmosphere was apparent from the moment we stepped inside and its definitely not a place you would feel uncomfortable at. When I stepped out onto the beach I couldn’t believe how beautiful it was. Towering cliffs on the one side almost made it look like some scene from Jurassic park. The beach with a river mouth and gorgeous green hill stretched out to the other side and I can see why people say they never want to leave. After our sunset adventure we were absolutely starving and I was so excited to tuck into the huge dinner buffet at the restaurant. They have buffet for breakfast, lunch and dinner so you don’t have to worry about food ever and it was great sitting on the deck with that beautiful view. Ok so I really just have to tell you guys all about the beautiful beach in front of the hotel. Its a quick walk through a wooden gate to get there and there are just so many areas to explore. Unfortunately it was high tide at sunset while we were there so we couldn’t walk all around the cliffs but Mike send his drone up and it looked amazing. There are caves and jutting rocks, cliff faces and so much green! When you walk to the far side of the beach, the river mouth spills into the sea and you cross it to get onto this super green hill. It looks like the perfect place for a picnic just watching the waves. On our first morning there I woke up early and it was quite misty outside. Looking out into the distance I spotted some animals on the beach. We hadn’t seen cows on the beach yet and as its a thing on the Wild Coast to find them there I knew it must be cows. I shouted at Michael who was still sleeping to get up we need to go take photos of the cows and he stared at me all groggy and sleepy. After getting all our stuff we almost ran there and as we got closer I started almost turning red. Nope no cows to be found only a few horses chilling in a group. It was still worth it though with the epic misty backdrop and the incredible local ceremony that was happening close by as well. Our reason for staying at Ocean View Hotel was to do a Facet Facebook live at tie Hole in the Wall which is probably one of the most famous places on the Wild Coast. Its pretty epic but quite a mission to get to. Its 10km away from the hotel but the roads aren’t the greatest so it might take longer than you would think. 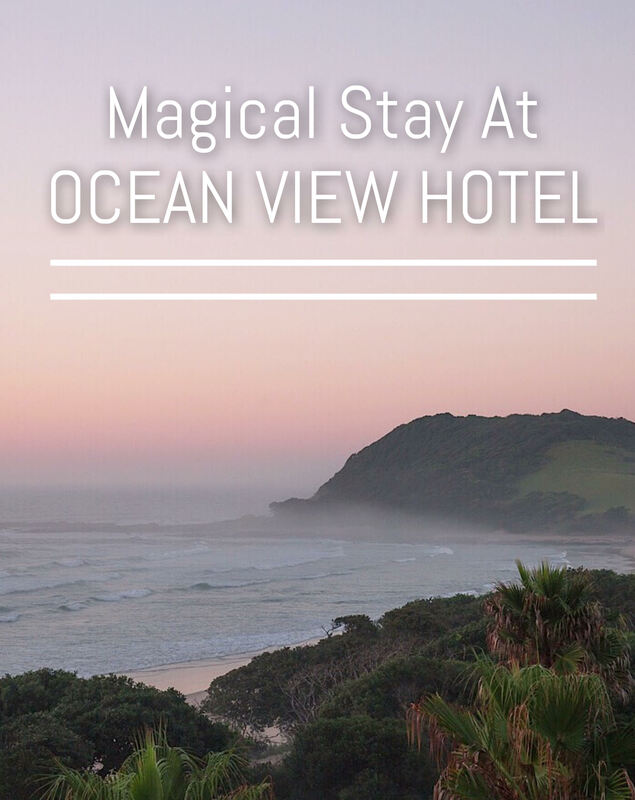 The Ocean View Hotel looks like the perfect base camp to explore Coffee Bay. What a gorgeous ocean and beach! The rocks and cliffs are gorgeous. And I love that Mike slept outside in a hammock — it truly sounds like paradise. That place sounds like a dream! No wonder you were ready to drop the bags and dive right into your holiday. Loving the views and the cliffs really do look like from Jurassic Park! The hole in the wall looks cool too! Did you get to go any closer than on the photo? Great review! Ocean View Hotel looks like an amazing location and the vistas from the hotel are beautiful. The beach with those cliffs are great for a misty morning walk and you did spot some horses too there. Its definitely worth considering if we had to visit Coffee Bay. South Africa is on our bucket list and now I think we’ll have to add this hotel too – it’s so gorgeous and those views are just incredible. Thanks for sharing! To be honest, the name Coffee Bay has got me curious. The view is amazing. I would love to wake up to that view. The beaches are equally gorgeous!